I’m about to take the plunge into letterpress. A semi-retired graphic designer: it’s an exciting change. On Thursday, I’ll take delivery of the above machine here in Canberra, Australia, and I’m excited and daunted in equal measure! Just the logistics of transport are boggling. I know that the flywheel is frozen and that the crankshaft box is missing which means the crankshaft is precariously mounted. Who knows what else? When I get it to its new temporary home under the carport (final destination: the studio), then I’ll get a better idea of what’s needed. Right now it’s still in the vendor’s shed. Where are parts obtainable? Trucks, rollers (unused Heidelberg branded ones are included) and who knows what else? Congratulations, I had a similar experience a while back with an 8x12 old style. NA Graphics helped me out with rollers and trucks. I would love to see some pictures and follow your journey. Good Luck. Tomorrow we help deliver it - it’s a group effort. I’ll post some pictures from that. Thanks. Well it looks like most of it is there. I don’t see the ink disk, if it is not there I don’t think one would be too hard to find. It is amazing what a can of oil and a lot of scrubbing can do. I particularly like the 8x12 for the way it opens wide and allows you to lean over it and get right up close when doing the make-ready. Hope the delivery goes well. Yep, moving will be quite a thing. Have teed up removal truck with big tail lift, driver/operator, pallet jack and helpful friends. Ink disk is there, removed by others, plus treadle and sundry other parts including some sort of ink duct thing. Thankfully, I think the crankshaft box is there and can be seen hanging off the crankshaft halfway between the frame and flywheel. Well, it’s done. I now possess a [email protected] OS 10x15 c.1897. That I thought it was 8x12 was disproved when I looked up the serial number then went out and measured the chase. My intention is to bring it back to working condition, but not to restore it, and then use it. I’d appreciate comments and advice on the best procedures. Btw, if it doesn’t already have a name, I will call it Ada after my great great aunt Ada Crossley, an Australian contralto from the Gippsland region of Victoria, who was living and working in London at the time of the press’s manufacture. Congratulations from another from Canberra with an interest in printing. I bought the Sterling/C & P pilot clone from the same seller in Fisher last weekend and like you, I have lots to learn. Your purchase included a promising collection of bits and pieces - if there is anything surplus to your needs I am in the market for parts/type etc that may work with my machine. I do know of a very keen press restorer on the coast who may be worth contacting - I’ve never met the gentleman and don’t like to place his name on a public forum but if you Google the words “Pambula lighthouse” you will find him. Congratulations on what may become your new addiction. I agree with your approach to getting it printing as soon as possible. Too many people want to take the press apart to clean and paint it. In the old commercial shop often the press was filthy except where the ink and paper touched. And there was oil on the floor. The press was well lubricated. The printer was interested in attractive prints, not attractive machines. Go back in the archives. There is lots of information on cleaning up the press and getting it working. Either by consulting an oiling diagram, or by turning and rocking the press, find all places where two pieces of metal work against one another. For some there are oil holes. For others, there are not. Clean as much grunk as you can from the oil holes. Flood all the holes and places where two pieces work against one another. Cycle the press several times. The extra oil will drip out and take some of the debris with it. Later, oil the press each time you use it. Any oil is better than none. 30 weight automotive oil is fine. I am an old sailor and hate rust. You have rust you can tackle after you get printing. Rust, oil, paint … spare parts, but something is missing here! Where is the alcohol dampening system? Couple bottles of that fine Australian Vino are missing! The doctor prescribes Coonawarra shiraz for such ailments. The aroma of ‘sweaty saddles’ permeates throughout. Few little gimmicks that may help:- source one gallon of ordinary Deisel (DERV) clear or coloured, makes no difference.! It is the best, bar none, for un-seizing, initial lubrication, etc etc. Construct a *Coffer Dam* around the base, “baste”, the entire machine for several hours/overnight/even over 48 hours, the coffer dam will catch the drippings, especially if redundant Towels are used, rung out and re used Ad infinitum.!! As you imply that the crankshaft does not want to turn, as yet, probably because it is seized, and/or dropped via unfitted bearing, merely After, good soaking and before attempting to move in either direction.?? take the weight of the unsupported shaft, with either a leather or canvas strop, well lubed with Vaseline etc, anchored high up on the machine with just enough tension to lift the shaft (un-supported end) to the true horizontal, compared to the base of the feet, spirit level if possible, it will save ripping the one bearing up any further, and will help re-fitting.??? I like your approach to bring it back to working condition as a top priority. Having a rusty old press that works is better than having a shiny old press that doesn’t. From what I see in the pictures this looks like a great project. I am enjoying your journey. Thank you all for your comments. You have been extraordinarily helpful and sharing. The flywheel now turns with the appropriate bearings bedded in their respective apertures and oiled. Gentle, gentle persuasion with an hydraulic jack and a few taps from a mallet via the tool de jour - a block of wood. A German car mechanic who I once worked with used this tool to ‘listen’ to engines. A v. versatile tool. BTW if the methods in my previous comment set off any alarm bells … Please let me know. Attaching bits and it starts looking better. More to come. 1. Should the pinion be attached by the pinion key with the blunted bit facing out or in - see pic? Logic says out. 2. Three unused Heidelberg inker rollers (371 x 51mm) came with the press. Looks like a good fit on the machine but the trucks (plan view from elsewhere on this site included) have a spindle - holey bit in the middle - diameter almost 1mm more than the shaft dia. Will this be a problem? Should I bite the bullet and patronise NA Graphics (and the US Postal Service) for the trucks AND rollers? Have to order the trucks anyway as 3D printing will be expensive and inferior and machining Delrin locally will also be expensive. Maybe some kind of thin sleeve? Overthinking? 1) Don’t have any experience with this piece but it sure looks blunt end out to me too? 2) Extra rollers are always nice to have so I would certainly not discard them, but new rollers and trucks that are properly fitted to the press are a real plus. When you first start printing on it you will have lots of things to feel your way through and problems to solve. Having rollers you can rely on will make the process much easier. When you have the hang of it, maybe a better time to tinker with the rollers. But, they look like good rollers and there is probably a way to make them work. Have ordered 6 x trucks from Todds Press Time and queried price and shipping cost for rollers. 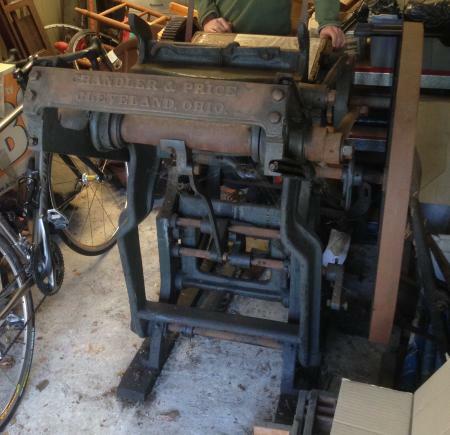 An old 8x12 press - rustier than mine - has just come up on eBay here with pics showing pinion key definitely blunt end out. Seems I have exceeded a limit on uploaded pics. Hi Andrew, welcome to the Canberra letterpress brigade, there are a growing number of us here. Best of luck on your printing journey. A blast from the past. Appreciate your good wishes. Now to oil again, bit more of a cleanup, oh and learn how to use it. After some cleaning and recovery, the press has been installed in the studio. Today it travelled approx 100 metres from the carport around several tricky corners and up a step to be installed in the studio, courtesy of Delfast couriers and a number of very helpful friends. Now we can get the studio to rights and create a good working environment for Ada to flourish. Latest: Ada the press is up and running! Here are pics of final placement adjustment and twiddling: slow and steady, as well as in situ in the studio. and can approach the press with more confidence now. Sometime soon atypica.com.au will feature a press presence. Really enjoying how this site allows you to defy gravity.